Those of you who have met my son know that he does not like to cuddle. He wants nothing to do with being held; he has too much to do. Until recently. Last night, Justin decided he wanted to cuddle with Robbie a little, so he brought the baby into bed with us around 10:45. Roberto stayed asleep for a little while, stretching out across Justin and smiling in his sleep. Justin tickled Robbie a little, and Robbie started laughing with his eyes closed and a big grin on his face. He rolled over onto his belly for a little while and snuggled closer to me, so I could rub his back. After a few minutes, Robbie sat up and moved between Justin and me to get kisses from both of us and then took turns laying his head on our shoulders. A few months ago, Justin asked me if I thought Robbie knew that when we kissed him it meant that we loved him. I said I thought so, but I really wasn’t sure. Now i know that he realizes that hugs and kisses are good, and he gets a kick out of them. And I’m hoping that, even if it’s only at night, Robbie might be more amenable to a little cuddling. This marks one year since the end of my maternity leave. I can’t believe that Zhining has been in our lives that long or that Robbie is that old or that I’ve been a working mom all this time. I remember the night before I went back to work; I was a crazy woman. If you don’t believe me, just ask Justin. Before I went up to bed, I yelled at Justin, telling him what a horrible man he was for forcing me to go back to work. Even while I was doing this, I knew it was terrible of me. Justin would have loved for me to be able to stay at home, but going back to work was what was best for our family. And then I stormed upstairs to Robbie’s room. I picked him up from his crib – he was still so small then – and took him into bed with me. I cuddled with him, cried over him, and told him how sorry I was to leave him. I panicked a little bit, wondering if this crazy Chinese lady was going to be nice to my son. Sure, she seemed decent enough. But what if he cried and she just left him in his crib in a wet diaper without a bottle for hours on end? And what if, God forbid, he didn’t understand her because she was only speaking Chinese? Like I said, I was panicked. Justin came up to bed and found me cuddling with the baby and asked me what I was doing. He calmly took Robbie from me and put him back to bed and then let me cry my way to sleep, which was exactly what I needed. And here we are, one year later. I’ve survived working full time, finishing grad school, and being a wife and mother. In tact. My child is well-adjusted and social. My marriage is strong. My career is exactly where I want it to be. I’ve graduated. Sure, my house is messier than I would like it to be, but it’s cleaner than it would be if I was home with Robbie all day. My time with Robbie is more precious, and so I enjoy him more. As angry as I was with Justin for “making” me go back to work, I couldn’t imagine my life without all these things to juggle. So, here’s to another fabulous year as a working mom! Justin and I had one of those weekends where we kept discussing different aspects of our marriage. It felt like every time we turned around, we were talking about something different. We don’t have these marathon discussions often. Usually, we let a fight build up, boil over for about twenty minutes, and go back to happy. Now, I don’t mean to imply that these talks were fights. They weren’t at all. We just worked our way through how our lives have changed in the past year, kind of redefining our roles. A major part of all of these talks came down to what it always does. I need more help, and Justin doesn’t feel like I appreciate what he does around the house. It’s the classic marriage war. We’ve all had the discussion (or fight on some of our less-than-stellar days) a hundred times. You want your husband to help while you try to cook, clean, feed the child, wash the child, put the child to bed. He wants to sit on the couch in his underwear and watch Sports Center. And he wants you to fall to your knees in gratitude when he puts away his own laundry. Hypothetically speaking, of course. I know that Justin hears me when we talk, and he really does want to help. He just, like any man, gets bogged down in life and can’t multi-task. We talked about how I would like to take time to just “be”, too. And how I could do it that much faster if he helped me. I wasn’t sure how well Justin had “heard” me this time or how much it stuck. However, I can say that I am confident he heard me, at least for a little while. Justin got home before I did this afternoon, and I called him to help me with a little game of “Pick a Baby”. On Mondays, I bring Robbie’s best buddy home from day care with us, and it’s a feat to get them both into my house. There was no grumbling or, “Give me a minute”. He came right down. In his bare feet. Now that’s service! We got into the house, and Justin disappeared into the kitchen. 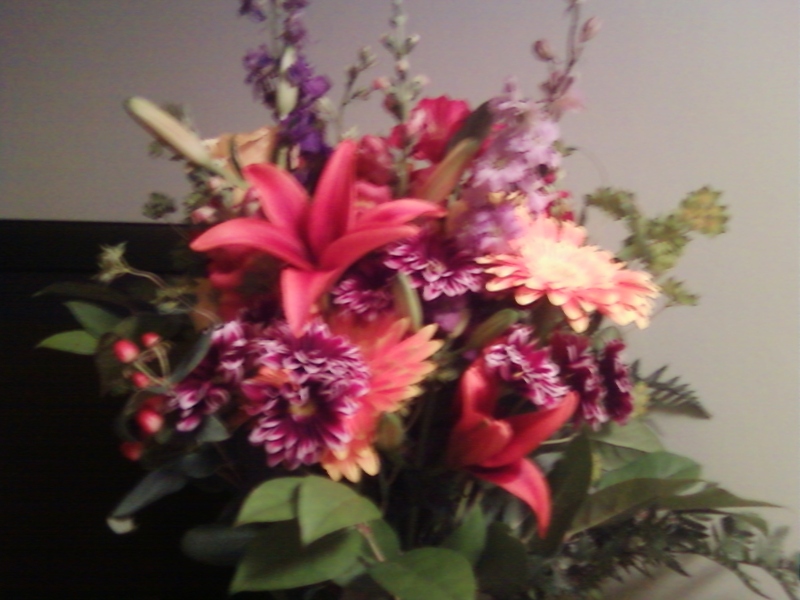 He came back out with a bouquet of flowers from my favorite florist around the corner. Robbie and I go visit her a few times a week. It is a gorgeous arrangement – perfect for fall. And Justin knows that fresh flowers are my favorite thing. I don’t think he could have let me know that he heard me any better. But he did. After giving me the flowers, Justin asked what he could do to help around the house. I said I thought we could get Robbie ready for bed after my run and then spend twenty minutes cleaning the house together. I came home from the run (2.5 miles in 28:05; that’s an 11:15 mile!) to find the boys sitting at the table with Robbie was eating dinner. We fixed dinner together and ate as a family. Then, we divided the chores and, at 8:15, were both ready to relax. It’s so nice to know that I’m ready for bed and have a few hours to savor. Sometimes these marathon conversations aren’t fun to go through. There are tears (at least on my end) and often hurt feelings. But, they end the miscommunication that we so often fall into as we rush from place to place and chore to chore. And they give us the opportunity to appreciate the other person in the end. We were a family on the move today! Justin impressed me with a 13 mile run this afternoon, as he prepares for a half marathon next weekend. Robbie and I worked in the front yard with our friend Elena, getting everything ready for fall. We weeded (something I’ve been meaning to do since, oh, July), raked, cut back hostas and lilies, and organized the mums I bought. I didn’t plant them yet, and I’m not sure if I’m going to bother. I still have 200 bulbs to get into the ground, and I guess those should get priority. Right? And hopefully one of the neighbors will help… But that’s a whole other story I don’t want to get into right now. While Elena and I were working in the yard, Robbie decided he wanted to go for a walk. Down the street. This kid has no fear; he just goes. And goes and goes. We corralled him in the Pack ‘n Play, but he really wanted to head down to Mass Ave. and see what was going on in the real world. It’s funny how he just suddenly realized that he could get so much more accomplished by walking instead of crawling. Because fall is Justin’s busy time with work, I feel compelled to fit as many fall activities into a weekend as I can. Even if it’s 85 degrees an feels nothing like fall, as was the case today. But, temperatures be damned, we had all the fall fun we could muster. This morning, we headed off to Arlington Town Day. I’m a huge nerd. I wait for this day all year. Well, maybe not all year. That would be really pitiful. But once late August roles around… Part of the reason I like Town Day is that I get to see former students. It’s nice to get to catch up with them for a few minutes and hear what’s going on, especially now that they’re seniors and getting ready to start applying to colleges. Today was a little more special, though. I saw three girls, one of them who wasn’t even my student, and they absolutely made my day. The first girl wasn’t my student, but she recognized me when we went out to breakfast. She told me that she hadn’t been in my class but she’d really wanted to because my class was “the cool class, the one everyone really wanted to get into.” Are you kidding me? It brought tears to my eyes. I think that might be the ultimate compliment, especially three years after I left the school. Then we ran into two girls who had been in my class, one of them, bless her heart, for two years. They told me they’d had a good English teacher last year, but my class was still the best English class they’d ever had. By the grace of God, I didn’t burst into tears in the middle of Mass Ave.
Justin, Robbie, and I had fun perusing the booths and buying raffle tickets, which it looks like weren’t winners… Justin stopped to meet our Congressman. I don’t even know the man’s name, but Justin recognized him standing in the middle of the road and waited to talk to him. God love him for that. After Town Day, we piled into the car for more mandatory fun. We were off to pick apples at Applecrest Farm in New Hampshire. I’ve found it’s much better to make the drive to New Hampshire because it’s not as crowded. You spend less time driving to get there than you do waiting in traffic to get to the Massachusetts orchards. We hopped on the tractor and took the five minute ride into the orchards. I’ve never seen Robbie look so serious; he was doing his best to take everything in. The smells, the sounds, the people, the trees. And then he turned and looked at Justin with a huge grin on his face, like he just knew how great it was going to be. And it was. We got him about a hundred yards into the orchard before we let him go. He had a good time toddling around. I picked him up, and we picked a few apples together. He dissolved into laughter every time he felt the weight of the apple fall into his hand. And then we had the best moment of the entire day. I put Robbie down near a tree with a low branch and waited to see if he would notice, armed with a camera. Robbie did notice. He gave Justin and me a grin and started toward the branch, arm outstretched for the small apple. He pulled at it a few times, but the apple didn’t budge. Undaunted and, apparently, hungry, Robbie grabbed the apple, pulled it toward him, and sank his teeth into it. He was a little surprised the apple popped away when he finished his bite. Shortly after, the apple fell and became Robbie’s prized possession. 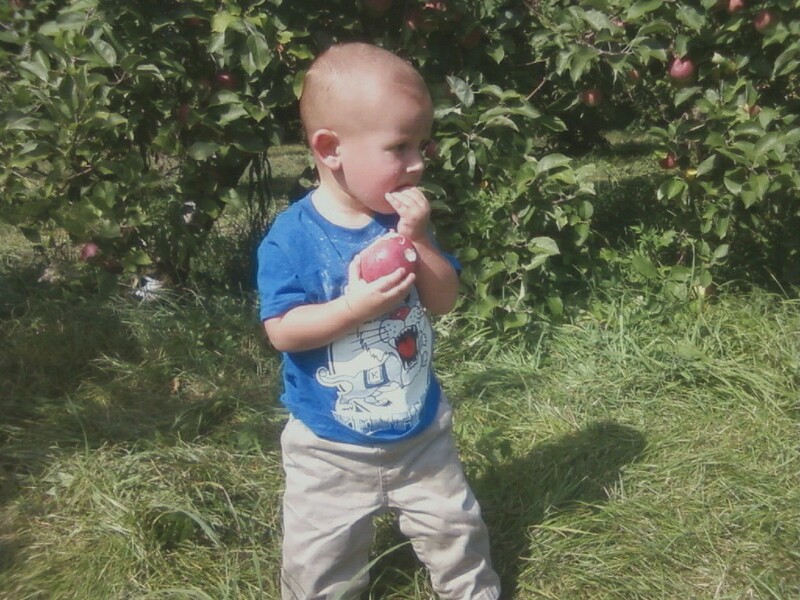 He held onto it as we walked to the front of the orchard, rode the train back, and waited for ice cream. Even Robbie has his limits with loyalty. When presented with a spoon of ice cream, Robbie tossed the forgotten apple onto the ground. Apparently, apple picking also makes you thirsty. Roberto downed my entire bottle of water, although about a quarter of it wound up on his shirt and pants. We need to work on his drinking habits… The water turned cloudy with ice cream residue very quickly. At the end of the day, Rob was no match for apple picking. He was fast asleep before we even hit the interstate to make our way home. And it must have done something to him because he cuddled with me before he went to bed, something he hasn’t done since he stopped nursing in May. At one point, he was on his stomach in my lap, his head nestled in the crook of my arm while I rubbed his back. He lifted his head up and shot me a smile that was pure bliss and made googly eyes with me like we used to do when he was a baby. You know the one I’m talking about, right? You’ve seen it. Where the eyes glaze over, and you’re totally in a trance. That’s one of my favorite parts about fireworks – watching people watch fireworks. Everyone looks like a kid. It was an amazing experience watching fireworks with Robbie for the first time. I got to say, “Look, a green one!” and “Wasn’t that the most beautiful one yet?” And you know what? I really meant it. It was like I saw the fireworks for the first time. I think that’s the best part about being a mom; I love seeing life through a fresh set of eyes. Fireworks, brass bands, fire trucks, and trains. I’ve seen these things hundreds of times but never like I have through Robbie’s eyes. Everything is shiny and new and amazing. Wouldn’t it be nice if we could all see the world this way every day? I think I’m going to try. It had to happen. After all, before now, it had only happened once. About a year ago. Until tonight. Robbie was playing in the tub tonight, blowing bubbles with his bottom and looking at me, laughing. And I contentedly read while he played. Until it was time to wash him, when I noticed the water looked a little yellow. And much thicker than it should. It took a little while for me to really see through the toys and bubbles. But boy did I see it. Everywhere. Diarrhea. I’m sure my eyes about popped out of my head, and I looked up at Robbie. He met my eye and burst out laughing. And tried to shove a toy in his mouth. A disgusting, diarrhea-tub toy. Which I yanked from his hands and threw out of the tub. Along with all the other toys, which are now soaking in a Clorox filled tub, hopefully disinfecting. I’m not sure why my first thought was to grab the toys and not the child, but that’s what I did. Maybe because if I’d grabbed the child first, the toys would have sat in the water, gathering nastiness. So, yes, Robbie sat in the tub and extra 90 seconds. That also bought me some time to decide what to do with Robbie. Obviously, I couldn’t just rinse him in the tub. That would need to be thoroughly disinfected. The kitchen didn’t feel like a great option, but it was the only one I had. So, the dripping child and I made a dash for the kitchen. Robbie hasn’t taken a bath in the sink for months, but he was much better at it now than he was eight months ago. Probably because he was so shocked to be in a new place. So, hopefully Johnson & Johnson’s bubble bath got him appropriately cleaned. And to think… All this happened when he’d already had “two big poopies” at daycare. Is there ever a safe time to bathe? Do you ever feel like you didn’t really live before you had a child? I never realized how much of my life I missed. On the weekends, Justin and I used to sleep until 10:00. After work, I would come home and hang out on the couch for a few hours. But ow there’s just not time for it anymore. There are too many things to do and enjoy. Take today for example. I picked Robbie up at 4:00, and we were off to the Farmers’ Market. After all, there are only a few more weeks that it will be going on. Where in the world am I going to get pasta, fresh wildflowers, and raspberry chocolate chip scones after October? And it’s so much more of an adventure going with Robbie. There are more things to look at, taste, and run to. He helped me pick out a bouquet of flowers this afternoon. While munching on a sugar cookie that had been dropped (by Robbie) on the asphalt. Now, I could have cared that the cookie had been on the ground. But I didn’t. We got home in time to see the UPS man delivering a package for the neighbors. I think he felt a little bad that he wasn’t bringing me a package, but he let me know there was already something in there for us (a Keenex box cover, shaped like a couch). In my past life, I would have exchanged pleasantries with the driver and gotten inside. Today, we took our time, so Robbie could see the truck start up and drive away. And then it was time for the five-minute stair climb. It’s so worth the extra time, watching him lean his head back to smile at me because he’s so excited that he’s doing it himself. And after that, there was time to empty drawers, eat dog food (Robbie, not me), and fix dinner. All before 5:45. Even a year ago, I might have put Robbie to bed and enjoyed quiet time. But there were still things to do. There was a run to go on with a girlfriend (we only did 1.5 miles instead of 2.5, but still!). There was a backyard to clean and a house to straighten. There was dinner to cook, lessons to plan, and blogs to write. And it feels so nice to have used all of the hours I was given today. I finally got it tonight. A quiet house. Almost all to myself. Robbie went down easily. I put him to bed around 6:45 and he played with his Fisher Price farm for about thirty minutes. Is it wrong that I have a toy like that in his crib? I figure it’s best to go with whatever works, and that appears to work. Justin was gone to class tonight, and he flies out first thing tomorrow morning. I won’t see him again until after class on Thursday night. I remember that this time last year, I dreaded his trips. I was terrified to be alone with Rob. Although, at this point, I was fairly used to days alone with Robbie. Justin was gone 42 of Robbie’s first 90 days. Now, instead of dreading these trips, I relish them. I love having a few hours in the evening to myself. And, in all honesty, Justin’s trips aren’t as lonely for me now that Robbie has become a real person who likes to interact and play. Granted, during the summer, when I was home alone all day, the trips made me want to claw my eyes out. But now the peace and quiet is kind of nice. I get my play time with Robbie after work and until around 6:30. Then it’s time to do whatever I want. I can eat what I want for dinner, watch what I want on TV. I could decide to go to bed at 7:00, which is actually sounding like a pretty great plan for tomorrow night. Justin and I were in desperate need of a new dishwasher. The top rack of ours had fallen onto the bottom rack, and the top spinner (is there a technical name for that?) had fallen off as well. So, we traipsed off to Home Depot, child in tow, two weeks ago to purchase a new dishwasher. It came Saturday. Last night, I posted an ad on craigslist for a plumber and had one volunteer to come install the dishwasher last night. Originally, he wanted to charge me $200. Being the savvy woman I am, I told him I had another plumber who would come for $100. He immediately cut his price in half. Now this “twenty minute job” took ninety. I kind of figured it would, knowing how Frank, the man who owned the house before us, worked his repairs and installations. But, everything was finally running and good. The plumber left, and I started the dishwasher before jumping in the shower. When I got out, I thought things sounded funny. Turns out there was no water going in to the dishwasher. It was all going into my neighbor’s ceiling. Knowing Justin, I thought it was best to not tell him and go straight to bed. Particularly since I was the one who hired the plumber. And I did go to sleep. Until 2:00 in the morning, when I woke with a start and couldn’t go back to bed. I decided it was a fine time to investigate. So I pulled the dishwasher out from the counter and found the errant tube. Water spewed forth whenever the dishwasher was on. But there was nowhere to put it. Well, there was a cup to put it in, but I wasn’t sure how that would help with the water. So I moved on to the instruction manual, where there was no mention of this tube. And then I checked YouTube for installation videos. Nothing about that stupid tube. I finally decided it was time to go back to bed. After all, at this point it was 3:50. So, I slid the dishwasher back under the cabinet. Too far. I couldn’t close the door all the way, and I couldn’t get it back out. And I didn’t care. I had to get some sleep in order to survive the day. I hoped Justin wouldn’t want to see the dishwasher this morning. In fact, I prayed about it. But it was the first thing he checked out when he came into the kitchen. And, observant man that he is, Justin wanted to know why the door wouldn’t close and the unit had come unscrewed. So I burst into tears. And Justin just hugged me and told me he wouldn’t have been upset (I’m not entirely sure I believe that, but I really appreciated it this morning). So, today I was on a mission. Our dubious plumber told me he didn’t know what that tube was for. GE had no idea what I was talking about and scheduled a service call. Home Depot told me none of their models have tubes on them. That’s where I drew the line. I asked her to please go look because I could not deal with trying to find another plumber. So, Jenny, my new Home Depot buddy, unscrewed her model dishwasher and looked for a black tube. Which she found. Plugged into the little cup I had found at 3:00 this morning and inspected. But not very closely because I missed the part where there was an opening into the dishwasher. I came home and had the dishwasher fixed in three minutes. And that counts unscrewing the countertop from the base in order to get the unit out from where I had pushed it in too far and it came up behind the lip of the counter. And now, my dedicated readers, I leave you to be thankful for your installed appliances as I head to bed for more than three hours of sleep.